Applications: For de-scaling and cleaning stainless and other metal surfaces. Suitable for air tools and drill chucks. Crimped wire gives softer stroke than twisted knot brushes. Product Notes: Stainless steel, 0.3mm gauge wire (0.2mm on 30mm wheels). Speed rating: 30mm dia 20,000rpm. 50mm, 75mm and 100mm dia 15,000 rpm. 6mm spindle. Please note that the spindle and fixing may register a magnetic signature. 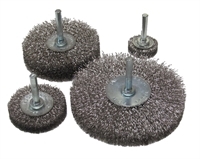 Also Available: For more aggressive cleaning and de-scaling, we offer twisted knot brushes for use with angle grinders. Promotion: Extra discount off full packs of the popular 75mm wheels.